Click on the image to go to a fully interactive infographic where you can find out just how much money people have buried, I mean, invested in clean energy in your country. It’s nifty. Have you ever thought about how lucky we are that only kind-hearted helpful souls are involved in the erstwhile cottage industry known as “renewable energy”? Imagine if a less-than-scrupulous agent got into these green-fields of money, and frolicked in the vast acreage of subsidies, schemes, and easy loans? Where would we be? The public would think the people and the industry were here to save us, the industry could prod levers of government to encourage more subsidies and pro-renewable energy legislation. The “cottage” industry could also pay for and help write reports that the government then used in order to convince the people to put more of their goods and chattels in the public-trough. In variations on the circular theme, the industry could apply for grants from the government to help pay for the reports it wrote for the government to help it earn even more subsidies, or to cripple it’s competitors. (eg. See here). Thus deadly positive feedback would spiral out of control. Then imagine it wasn’t just less-then-scrupulous renewable energy fans, but if money-hungry-profiteers from large well financed houses were set loose in a global trough? Ponder that it doesn’t take a less-than-scrupulous operator to fund an army of full time emissaries-of-green as PR agents and lobbyists. Any honest businessman would do it, and no one would fault that. It’s just advertising and networking. Even a small percentage of $243 billion worldwide buys quite a lot of lobbying. It’s time the world woke up and realized that renewables are no longer a small time struggling industry. They might not produce more than a tiny percentage of the goods and services, but they’re a large multinational conglomerate force. 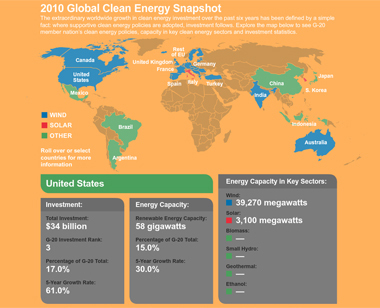 WASHINGTON, March 29, 2011 /PRNewswire-USNewswire/ — Global clean energy finance and investment grew significantly in 2010 to $243 billion, a 30 percent increase from the previous year. China, Germany, Italy and India were among the nations that most successfully attracted private investments, according to new research released by The Pew Charitable Trusts. China continued to solidify its position as the world’s clean energy powerhouse. Its record $54.4 billion in investments in 2010 represents a 39 percent increase from 2009. Germany was second in the G-20, up from third last year, after experiencing a 100 percent increase in investment to $41.2 billion. The only good news here is that The US and UK are headed down the rankings of the hall-of-renewable-fame as the slowdown of helpful legislation turns off investors. But China attracted a huge slab of “investment”. That doesn’t make China green, it just means — like everything else — the worlds manufacturing base for those gadgets is in the Far East. Italy attracted $13.9 billion in clean energy financing last year, improving its global standing to fourth, from eighth in 2009. Italy is the first country to achieve grid parity, or cost-competitiveness, for solar energy. For the first time, India joined the top 10 ranking, attracting $4 billion, a 25 percent increase. * Regionally, Europe remained the leading recipient, attracting $94.4 billion, led by Germany ($41.2 billion) and Italy ($13.9 billion). The Asia/Oceania region, led by China, continued its sharp rise, attracting $82.8 billion, a 33 percent increase over the previous year. The entire report, including country profiles, and too-clever-by-half interactive graphics www.PewEnvironment.org/CleanEnergy. The green energy sector is, for the most part, as good a sector to invest in as the perpetual motion machine sector. Perhaps someday with enough taxpayer funded subsidies it will happen…in a pig’s eye! It amazes me that al Gore preaches the green gospel and yet has invested through his hedge fund in oil and gas! I suppose that is consistent with the reasoning behind his decision to purchase shoreline property while pontificating on the imminent rise in sea levels that will soon harangue the human race. The day someone can develop a source of energy that is as efficient and as inexpensive as fossil fuels the free market will catapult it to fruition. Hopefully, our posterity will have evolved beyond what today passes for progress, probity and profundity. I remain cautiously optimistic. I believe the” Hockey Team” will go the way of the Donner party! As the situation worsens they will probably eat their own to survive! And how much of the $243 billion is being spent in China? I think they have over 40% of the silicon based solar (its very energy intensive so you need cheap power to be competative). I also think they are going gang busters in wind, exporting nearly all that they manufacture and they have cornered the market on rare earth materials used to make advanced magnets for generators. The Soviets used to say the west would sell the rope used to hang capitalism. With the collapse of Soviet Union that statement was made obsolete, that is until someone made a green rope. In the UK, the renewables scam is slowly unwinding. People are coming to realise that higher electricity prices are partly due to subsidising wind farms. Wind farms are now being shown to be anything but green. The Green Investment Bank is in trouble. Developers claiming to be “saving the planet” are now seen as greedy bar stewards who don’t care about the fact that they are ruining our heritage and beautiful countryside, ruining people’s lives and destroying the economy. Wind farms are now widely seen as great white elephants and as monuments to political stupidity and technological ignorance. Does anyone have any ideas how to make some money on a potential bust in this area? I’d like to put some money where my mouth is if there was a reasonable way to place a bet. Imagine if a less-than-scrupulous agent got into these green-fields of money, and frolicked in the vast acreage of subsidies, schemes, and easy loans? Where would we be? Once in a while the COSMOS magazine has an article that at least makes some sense in teaching about how science should be perceived. The 21 June has one titled “The Scientific Method” by Tim Wetherell. The most common and perhaps serious mistake that has me throwing things at the TV is glib statements predicting what science ‘will’ discover in the future. It usually goes something like this. “We’ve discovered x and soon we’ll discover y.” The problem there is that you’re essentially beginning with your conclusion and confidently predicting that the data will ultimately support it and that’s the antitheses of science. If you knew what you were going to discover before you’d done the experiment, there would be no point doing it. Crazy ideas like Mars moving in little circuits as it orbited the Earth were introduced to make the observed data fit a concept that simply ‘must’ be correct. Of course in the end it turned out that this model was completely and utterly wrong. But brilliant minds – and they really were brilliant minds – were so in love with an idea of how the world ‘must’ be that they didn’t allow themselves or anyone else for that matter, to contest it. Sadly this tendency is still alive and well today in places. What he is saying, I think, is that ‘consensus’ is not the way science is proven or done. My fellow Germans are known for their fear of being dependant on international supply chains; so they happily invest into PV. The Communist Chinese government loves big infrastructure projects so they squander the Dollars they have squirreled away on huge dams, more high speed railway than the populace needs, highways and MagLev trains and PV and Wind turbines. In Germany as well as in China these are White Elephant projects; practically useless, with a symbolic value, and a Keynesian creation of (not much) employment. Obviously, for Germany it would be far better to simply BUY fossil fuels we need; we earn enough money through exports and have a huge positive trade imbalance. Same for China. And for all practical reasons we do that, still the Chinese as well as the Germans need to scratch an itch and build these White Elephant projects – for different reasons but with the same effect. That being said, there is another, old, huge infrastructure project that started out as a White Elephant but today forms the backbone of Germany: the Autobahn network. During the third Reich, nearly nobody owned a car and Hitler’s vision of the Kraft-durch-Freude-Wagen didn’t materialize until after the war when it was reborn as the Volkswagen. So it was an investment that paid out much later than planned and didn’t pay much of a dividend for the project originators – well, maybe it facilitated this or that Blitzkrieg but that was a side benefit at best. Similarly, in 10 or 15 years PV might be cheap enough to actually be a useful and unremarkable everyday technology. The early loss-leader investments done now by China and Germany will be of interest only to historians. Probably we will have roof shingles that we will connect to the grid and each one of them will contain a miniaturized complete PV installation and be slightly more expensive than a non-electrified shingle. All the political market-rigging done now will do little to accelerate or decelerate this development process; product development is a stoical thing that takes its time and is driven by inventors and big industry, not by politicians. The rest of the world can take a second-mover advantage over China and Germany; or a third mover; China was already the second mover. Okay, so you will buy all your PV panels from China, but so what, we’ve been buying Nintendo toys and Toyotas from Japan for decades now and it didn’t destroy us. So at the moment, the PV craze serves symbolic purposes but this will change; the excitement about PV will die down before this change happens. Folks, any day now science is bound to discover how to violate the laws of physics. I mean surely, “Beam me up Scotty,” must eventually come true. Gene Roddenberry said so. Then there are the laws of finance. Surely it must someday be possible to spend more than you have and stay in the black. Just look how many are searching desperately for the secret. It must be out there somewhere. Green energy…we could always dye the crude oil green, Eddy. Think of all the jobs created just to make green dye. Remember, you heard it here first. Green jobs at last! For the people who want to short something: Vestas is already below their 5 year low, so maybe it’s too risky to short them now. Battery and Ultracap makers like Maxwell are still not busted and have enormous P/E Ratios… a bust is probable once the electric car / battery tech euphoria fizzles. Biofuel shares like German Cropenergies have normal P/E ratios but will suffer when political support / subsidy levels drop. This will happen when crop failures occur due to the ongoing solar minimum / dropping temperatures. We might not be willing to sacrifice so much crop for so little fuel anymore and decide to run our cars on shale gas when things get tough. Caveat: I am not a shorter. But these would be the ones where i would still see potential for shorting. As a permabull, these are the stocks that i avoid at the moment, so they would be interesting for a shorter. Shorting green energy? I’m in the industry and I’ve been trying to stay conservative with my inventory for the last year. I went into the green industry with my own company about 8 years ago. I was one of about 3 in town. The non-profit organisation promoting renewable energy used to have meetings with three or four people in the room and that was it. I don’t know about the last few meetings, but when I refused to renew with the non-profit because of a major difference of opinion in its aggressive promotion of gloabl warming as the carrot to encourage city and community investment, there were well over 100 wide-eyed newbies in the room all looking to cash in on a booming market. Many have invested in flashy new pick-up trucks, fancy offices and aggressive sales reps. I don’t know whether I’m being paranoid or not, but I’m waiting for the backlash. There are going to be many people who will lose a lot of their money when the green customer finds out he or she has been the victim of a scam. It’s not going to be pretty. I figure when the US auto market starts to promote the design of a mass produced natural gas vehicle instead of hybrids, and the US government makes noises about encouraging natural gas fuelling stations, then the green industry will have one foot in the grave and the other on a banana peel (at least for another 25 or 30 years). That is why Germany is probably the world leader in the adoption of PV technology, although other countries are fast followers. It is all a scramble for self-sustainability to give some economic certitude. In my view, PV is the wrong technology. But it is the best “green” technology we have. Well it is best, if you ignore the environmental and social costs of manufacture – but they are in China, so the European Green movement doesn’t really care. And while I am waffling on about green technologies: It occurs to me that the subsidies on manufacture and use of certain technologies exist solely as a disincentive to further research and development. If you are a manufacturer, and the Government is giving you subsidies that make your business profitable with your current range of products, and if there is a high probability that a more efficient product line would attract lower subsidies, then what is your incentive to invest heavily in research and development to find a better technology? So the allocation of subsidies become yet another lever that governments can use to “fine-tune” the economy. I recently spent some months hiking across Navarre, Castille and Galicia. To describe wind-farms, two words come to mind: obtrusive and diffuse. People here have no idea of how much hardware, cabling and land use is involved. I’m inclined to think that it won’t happen in Oz, except as a green fetish for photo-ops. You see, those thousands of turbines don’t sit in paddocks together. They are strung out on hill crests, most of which may already have been cleared in Spain. Here in Oz, those crests would have to be bulldozed. For the enormous amounts of cabling…further extensive land clearance, and on slopes. Costs and returns? You’d need to be in the EU prior to ’08 to even think about it. The periods in which massive corruption and wild idealism intersect tend to be brief, for obvious reasons. God, how I love coal! When Australian land masses are turned over to private trusts and foundations, do they still belong to Australian people or are they really a debt for equity swap? Are our biodiversity hotspots and land resumptions really for environmental benefit , or global carbon offsets for large multi-national companies as a cheap license to get cheap labor in one country and deny another country the prosperity they gain by stealth,by being major stakeholders in programs and policies. Worth looking up is ex-ministers and public servants, how many are involved in the renewables gravy train, and how they set up the renewable energy as a fail safe platform for their own benefit. From conception, to final installation of solar panels and wind turbines, how much industrial labor and technology is awarded to Australians, or are they money collectors and installers of other countries technology. A great proportion of Australians have affection and respect for the environment, and to use science as a method to redistrabute wealth, and to bring about a new wave of poverty in Australia.Also using the green religion as a weapon to justify increasing energy costs , and using taxpayers funds to subsidise your pet projects, while the funds could be going to worthy projects to feed and shelter,education and health real Nation building programs that have proven to benefit this country the last 200 years. Notice specifically how the emphasis is on the ‘up front’ size of the plant, the Nameplate Capacity, or the maximum power that the plant can theoretically produce. This always artificially inflates the ‘size’ of the plant, because at no stage, ever, can the plant deliver that power for the full period of operation. The major emphasis should not be on the Nameplate Capacity, but on the actual power that the plant delivers to consumers. It’s sometimes difficult to explain, so let’s look at a typical example for comparison. A large coal fired power plant, say Bayswater has a nameplate Capacity of 2640MW. The new Solar Power Plant that Julia announced a week back has a Nameplate Capacity of 250MW. This makes Bayswater 11 times larger than this Chinchilla Plant. However when you look at the actual power delivered it’s a complete other story. Bayswater CAN and does deliver 17,500GWH (GigaWattHours) of power to consumers. The new Chinchilla Solar Plant is hoped to deliver 550GWH. This means that Bayswater delivers 32 times as much power. The same in the U.S. and the same everywhere else in the World. The people pushing these Wind and Solar Plants will always use the inflated Nameplate Capacity because it sounds large, but the power delivered is indeed quite small. Accurate data shows that the best Wind can provide its power is at 25% (US), and 20% (Worldwide average) while for Solar, that figure is down around 15%. Those figures equate to hours in a day averaged, so that gives Wind 6 hours a day at best, and Solar 3.5 hours a day. True, but it would still be cheaper to build redundancy into the system by building LNG terminals and underground storages (converting old mines into LNG storage) and start to explore shale gas. Wind and PV will not make us independent of Russian Gas. Well actually our government knows this already and does exactly that… They never expected renewables to fulfill that role; imagine a blocking high in Winter that sends all the wind turbines into standstill for forty days. PV produces 2 % of our electricity ATM… purely symbolic contribution; initiated by the Red-Green government 10 years ago and kept alive by the conservative government because people like it so much… (they really do). Tony I ask this question the other day on another blog and got no reply. If the amount of money that the government has spent on renewables since it has come to power had been spent on replacing brown coal powered plans with gas fired power.How many plants would we have built by now and how much emissions would we have saved in comparison to renewables. And what is the largest gas fired plant currently in use in the world. In reference to the Cape Grim Greenhouse Data site put up by CSIRO, could you make a semi-permanent post available where those interested could examine and dissect the contents, then come up with questions to put to the CSIRO in a joint submission. ‘CSIRO Changing Atmosphere research group leader, Dr Paul Fraser, said the timing of the site’s launch was not related to recent criticism of climate change science and scientists in mainstream media. “We have in CSIRO’s records one of the world’s best records [of climate data] and we have been anxious for some time to share those data with as wide a community as possible,” he said. As to the dissection I suggest, I refer particularly to a sidebar item, “Understanding Climate Change” which largely consists of 5 chapters stating the “bleeding obvious”! If it was a Grade 6 science student’s exam paper one could not help but give it a huge “FAIL” with such mind-blowing gems as ‘Change is happening now’. “Consensus as strong as the one that has developed around this topic is rare in science”! Most of the comments are taken straight from the AGW/UNIPCC/Government CO2 song sheets. This next statement from the site and the following contradictory disclaimer hardly inspires confidence, and is in fact laughable. Rather tnan us preaching to the converted all the time, let us take up the offer to “interact”. I can’t help but think guys that this large money-merry-go-round from the carbon tax will net the Government lots of dollars on the GST side of things as well. If the price of carbon rises then so what, it will just give them more GST. I hate Juliar and this government, I can’t think of one thing to nice to say about them and as far as I am concerned, lets toughen up and stop getting touchie feelie. let’s oust this government any way we can. Lord Christopher Monckton I salute you. I thik callig a spade a spade is a good thing, sorry Jo. When the Green Balloon bursts, the goo that fills it will make a lovely mess. Then maybe we can get back to spending on things that work, and deep-six all the no-hoper renewables scams. Wonder if this legal decision will temper enthusiasm for investment in Green Energy. Solomon who is an AGW skeptic picks all the juicy bits from the Left wing Justice Ginsburg’s put down of the alarmists. I noted the NYT, which is a cheer leader for AGW alarmism did not publish those bits in its report. Nice to see that Freeman Dyson has some clout with lawyers. The justices of the United States Supreme Court this week became the world’s most august global warming sceptics. Not by virtue of their legal reasoning – the global warming case they decided turned on a technical legal issue – but in their surprising commentary. Global warming is by no means a settled issue, they made clear, suggesting it would be foolhardy to assume it was. Don’t get me wrong , as I think this judgement is significant / positive for us sceptics but Solomon may have “glossed” it up abit. @Jack Taylor : I think you’re in the USA but Australia had a recent condensed experience with this. For a long time, rooftop insulation was a small-ish industry, with one or two big players but a whole host of smaller businesses servicing local areas, doing both installation in new houses (I think now mandated by law) as well as retro-fitting existing houses. After the 2008 finance blow-up, our current government was just 6 months old, and had inherited a huge pot of saved-up money from the astute management of the previous government. Whilst they promised hand-on-heart they wouldn’t do their normal thing and waste this pile of cash, once they had an excuse in the form of the GFC, they busted open the locks and got stuck into the cash pile with snowshovels. One of the schemes that was invented was to retrofit a couple of million households with rooftop insulation. About $1 billion was thrown at this. Realistically, you were supposed to get a quote, and you would get $1500 or so back from the government, and pay the rest. Actually, what happened was that the small industry of insulation installers was overwhelmed, and just about anyone with a pickup and an ability to rope in a couple of teenagers got into the insulation business. Every single warehouse across the country was stuffed full of batts, all made in china. There was no quality control, no training, no guidelines, just a flood of cash into a previously small industry. The washup was that 4 young people were killed doing installations, scores of house fires from dodgy work happened, and the government lost it’s nerve and pulled the program. All those people who had rushed into the industry rushed out, and the next 10 years worth of retrofit demand had been soaked up. A lot of previously profitable small businesses then collapsed, and a big fat contract was handed over to the largest companies to go around and re-check all the installations that were done. All this was done under the rough fig-leaf of keynesian economics (though I doubt anyone in the government actually read any Keynes, much less understood it). This gigantic waste of money destroyed an industry, killed young people and burnt down many homes. And all for the ridiculous goal of saving a few tonnes of co2. This all happened in the space of less than twelves months from photo-op to the search for the guilty. The solar and wind subsidisation is orders of magnitude bigger, global in scope and just as insidious. Right now, in Australia you can still get solar subsidies for installation of PV and a generous feed-in-tariff of 3 times the going rate of electricity. As the deadline approaches for the cancellation of this scheme (or winding back) my letterbox is regularly stuffed full of ‘save the planet, buy solar’ flyers. My local paper has a solar ad on every page. I recently went to a ‘home show’ and every 5th stall was a solar company – and not one customer to be found. The PV solar industry is about to experience a bust and contraction of the size that will make the insulation debacle look like losing a monopoly board game in comparison. At least no-one has died, or no houses have been destroyed – so far. But people will be out of jobs, companies will collapse and people will get upset. And the coal will continue to be dug up and burnt in exactly the same numbers. For all the socialist claptrap about avoiding the boom/bust cycle of economics, the incompetent socialist parties of the world try and mix their hare-brained public spending schemes with free markets and end up making things 50 times worse with their cack-handed interventions and heavy-handed overcorrections. Most of these schemes have been setup to try and segue into carbon trading down to the individual levle, so that feed in tariffs coudl be replaced with global co2 certificates. But with carbon trading looking shaky, kyoto 2 dead and politicians picking up the scent of votes in rejecting these schemes, this is not going to happen. Eventually voters and canny politicians looking for an issue to wedge their opponents will point to the subsidies and say – this is not fair. You are being conned. And the resulting bust will smash the industry for years to come. as always, it’s more complex than that, and if Jo doesn’t mind, this may take some explaining, and keep in mind that this is just a start. Go back to the mid 70′s when the last of those large scale coal fired plants came on line. There was then enough electrical power to cover every contingency, and the same applied across the whole of Australia, and because of that there was a lot left over. Each year actual consumption has increased on average 7%, as the population increases, naturally. Don’t just think of this is where all those new people live, Residential 38% of consumption. It’s also for Commerce 37%, where people work, are administered, and shop (Coles Woolies, every shop, etc) and also for Industry 24%, where people work. So, with that increase each year in consumption, we are now at the stage where those plants are approaching the limit of all the power that they can supply, those existing plants are aging, and old technology, and even older plants having reached their use by date, are closing, or will be closing. In the interim, NO State Government has covered those bases by building new large scale plants to cover that. Now we find that it’s too late, because any new large scale coal fired plant is strangled at the thought bubble, and would never get off the ground. So, we have the case of new ‘renewables’ going in, plants which patently cannot supply those levels of power for when they are needed, and keep in mind that 60 to 65% of every watt of power being generated is required 24/7/365. Just saying how many new plants ‘could’ have been constructed now becomes even more complex. What people are not being told is that where those renewables are being constructed at a huge rate, the U.S. as shown in Jo’s original Thread, that the huge construction of these plants has in fact led to an increase in CO2 emissions. Because those renewable plants cannot provide that 24/7/365 basis, those existing coal fired plants ARE in fact actually supplying more power to the grids, as are those Natural Gas fired plants (at an even greater rate that for coal fired power) hence there is an increase in CO2 emissions. Now, while we are told coal fired plants are closing down, in the U.S. and as Julia told us, in China, what is actually happening is that smaller plants, mostly less than 50 to 100MW Nameplate Capacity are the ones closing down, and most of those are ones that have in fact reached their use by dates, and were in fact older (well, ancient really) technology. The average life span of a coal fired plant is 50 years, which can be extended out to 60 and 75 years, and the current average age of every U.S. coal fired plant is 48 years, approaching 49. NOT ONE large scale coal fired power plant, greater than 1500MW has closed in the last three years I have been blogging about this. That’s explained at the Post at this link, sorry, again, one of mine. So, it’s a difficult thing to say how much versus how much because it’s more complex than that. Added to that, the power is needed specifically in the areas where it is being consumed, so it’s no good building a new Solar Plant in the Simpson Desert where the Sun does shine 24 hours a day, or new wind towers on the Nullarbor plain near the Great Australian Bight, where the wind blows all the time, and then transmit that power to the Eastern seaboard. Keep in mind that the best design parameters for Gas fired power plants is that they be designed for Peaking Power, eg short run times, say 6 hours a day, so to use them for 24/7/365 power considerably shortens the life of the turbine. Again, sorry to take so much space here. Browning and Garris, “Past and Future History” page 30. I think Solomon highlighted the general thinking of the justices of the USSC about CO2. It was a refreshing aside to the legal decision and shows that the justices had what appears to be a skeptical view on CO2 being a pollutant. Michael Gerrard in the piece you quoted is giving his legal opinion. As he is an environmental lawyer he may have wished the Supreme Court justices had refrained from giving the public advice on where to get the good oil on CO2 from viz Freeman Dyson. A well known “heretic”. The government-owned body confirmed that its 1,800 staff were in line for bigger bonuses than the £1.4 million they shared last year after it “met or exceeded” all its targets. Each worker will receive about £800 on average. Smaller forecasters, who claim to be often more accurate than the Met Office, described the bonuses as a “disgrace”. Last month the House of Commons transport committee censured the body for failing to warn the public of the coldest December in 100 years. The forecaster also predicted rainstorms for the royal wedding, leaving thousands of spectators baking in anoraks in warm sunshine. Jonathan Powell, the chief forecaster at Positive Weather Solutions, a three-man outfit that successfully predicted the Big Freeze, said: “I am disgusted that they are patting themselves on the back and paying themselves fat bonuses when they are not even issuing a full range of forecasts. Had the world adopted the foresight of China when it introduced its one child policy, instead of massive denigration, there would be little if any of the present wasted resouces on renewables. These funds could be better used to improve the smaller worlds population. But then of course the multinationals, and big business would have found another way to syphon of taxpayer funds via government to pay their insanely high salaries. This is the link to the World’s largest Power Plants by type, and people, I’m so sorry that it’s a Wikipedia site, but after all, this is only informational, so they can’t insert as much in the way of an ‘agenda’ here as they do at all their other sites on electrical power generation. As you can see, all the largest Natural Gas Plants are in Japan. However, scroll down and check out the area listing large scale Solar Plants, and from that just hazard a guess how long it’s going to take to even begin replacing large scale coal fire power. Incidentally, you’ll see that the largest power plant on the Planet is China’s Three Gorges Dam Hydro Plant. This plant actually supplies between one third and one half of Australia’s total power consumption. If any of you have an interest I have a small 4 Part series at this link which tells about this project, er, with no CO2 emissions whatsoever. This editorial in The Australian is enlightening. Senator Graham Richardson, the Federal Minister for the Environment and former headkicker in chief for the right wing of the NSW ALP,is a born again greenie. He wants to stop logging in NSW and QLD forests and he wants to do it by “negotiation” rather than by imperial edict. However some States have environmental priorities that differ from those of Senator Richardson. The Greiner Government thinks that environmental damage caused by woodchipping on the NSW south coast is offset by export earnings and job opportunities. The Ahern Government feels the same about logging in Queensland rainforests. The problem for greenies seeking broadbrush renovation of society is that our Constitution makes no provision for national environmental legislation. No worries,says Senator Richardson. We we will use the Federal Governments authority under the external affairs and corporations powers to bludgeon the States into line. Last May, keen to demonstrate his greener than thou credentials, Senator Richardson flagged a possible referendum to give the Commonwealth specific authority in environmental matters. The trouble with referendums is that voters always say no. But what the government cannot deliver directly it can deliver through the side door,using the High Courts generous interpretation of the foreign treaties provisions of the Constitution. Beginning in 1975, the court has permitted great expansion of Commonwealth power. The chief weapon has been Section 51  of the Constitution,which gives the Commonwealth “power to make laws for the peace,order and good government of the Commonwealth with respect to….external affairs”. This has been interpreted with increasing confidence – edging, indeed,towards a macho swagger – by the Hawke government as justifying any action for which support can be found in the myriad international treaties to which Australia is party. This reasoning was used to uphold legislation preventing the construction of Tasmania’s Franklin Dam, which threatened to inundate world heritage listed forests. It has become entrenched as a doctrine that gives the Federal Government power beyond the wildest imaginings of the designers of our Constitution. At present the Federal Government seems intent on using its external affairs powers to override State sovereignty on environmental issues.The question is should it do so? Limitation of powers is the heart of the Federal system. Certain things are the province of the States;others of the Commonwealth.If a State desires legislation on something beyond its power it must persuade the Commonwealth.And vice-versa. Sometimes,this prevents desirable legislation.It also prevents any branch of government from being tempted in the direction of oppression. The Government seems to be surrendering to temptation and is at risk of making a mockery of Federal principles. In many areas where they were once sovereign,the States are now mere agents of the Commonwealth. It may be legal but it is not right. Senator Richardson learned his politics in the hard school and apparently has not lost his faith in muscle as an instrument of policy. Principle apart,he should be cautious about establishing himself as gauleiter of the environmentalists.Quicksands exist out there amidst all the greenery”. Which proves my point – treaties entered into become the supreme law of the land. Mattb – if you decide to enjoy your day and walk around with a smile on your face, I’m completely justified in calling you gay. Being factually correct does not make you context-correct. Words change meaning and pick up connotations as they go. ‘Deniers’ is strongly linked to holocaust denial. Maybe not in Australia so much, but in the USA and Europe it has very strong connotations. It’s dumb and people shouldn’t do it. Same as they shouldn’t call people Nazis just because they disagree with them. It’s a stupid term anyway – especially in the form of ‘climate deniers’ so beloved of hyperventilating bloggers and columnists – what on earth does that even mean, anyway? How can one deny climate? You should acknowledge it’s a labelling term used to try and close down debate rather than to try and just group a set of people under a collective. What, exactly, is wrong with skeptics, as a shortened form of ‘agw skeptics’. What most of use are is skeptical of the IPCC science. We don’t deny that it exists. If you want to win an argument or debate, you don’t start by trying to debase the opposition with a label, unless, of course, you’re trying to win a propaganda war, which is a totally different beast. 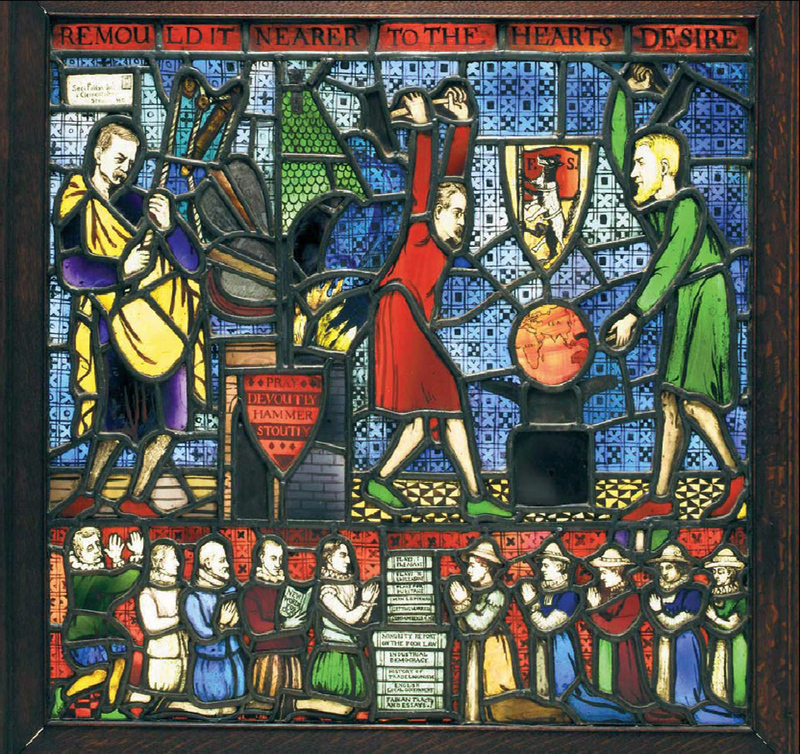 The Fabian Societies logo is a wolf in sheeps clothing. Here are the contact details for this TRAITOR “steve fielding”…. Send him some of your “thoughts” and home truths !!!!!!!!! Household Solar Power – Don’t Believe The Hype ! This is also enlightening ! You are absolutely 100% correct ! POLL RESULTS : Should there be a price on carbon?….. The people have spoken AGAIN ! Global warming is the biggest fraud in history ! Thanks for putting me on to that ausraliamatters.com site. We should shout its name from the rooftops so that everyone knows about it. I keep seeing links to these polls re a carbon tax. I have voted in 3 or 4 now & in nearly every case where they are run by a MSM organization, it would appear that ~80% are against the tax. Some of the ambiguous party polls are swimming against the tide of opinion. You have to wonder how tht happens eh? I hope these polls can be all listed complete with the bar-graphs etc & put together in a single blog or article. It would make sound material top blitz a few dithering pollies with. Clean energy is still NOT efficient energy. Harvesting energy individually has NOT been looked at as it is too cheap a concept to create. Better to manufacture 18 turbines when one can generate enough energy by simply organizing energy to work together. Well, since no one seems able to explain the difference between climate and weather in a stantistically meaningful way (other than some rather arbitrary decision about averaging over 30 year periods), I’d say there’s a meaningful case for climate denial. What you are left with is short term weather, and averages of that weather over various time periods, plus whatever spectral analysis you think might be interesting. Conceptually the idea of “climate” doesn’t contribute anything useful other than as a simplification for the news media. I agree though, that the insinuation of linking disagreement with regard to trends in weather to historic massacres is pretty ugly stuff. Just ask an Armenian how it feels when no one remembers the tradgedy that killed your family. It would then be the Commonwealth’s burden to prove that the laws it made, in respect to external affairs, will result in good government, peace and order. If a treaty threatens good governance with existing or introduced legislation then the high court would have the power to nullify the treaty or said legislation. In many areas where they were once sovereign,the States are now mere agents of the Commonwealth. It’s called Federation. Contracts were signed and a constitution enacted. In other areas of our society it’s referred to as doing business. If and when the states don’t feel that the selling off of some of their sovereign rights provides a net benefit, they can always go rogue and default on their contract. In the mean time, they are going to have to eat a big slice of stfu. Thanks Michael for the memories. I was nastalging pretty hard on Richardson politics. For those not familiar, he was chief Labor head-kicker at the time and one of this country’s more noteworthy scam artists and corporate criminals. You only have to help us understand CAGW to receive up $250,000 of this? There won’t be any money left! They are all mad! We know the madness will eventually cease, necessity gives birth to things. 1) “Scientist” credibility is gone for 2 decades. “err, sorry about that” won’t cut it as an apology. No credibility = No funding. This has serious implications for humanity. Science funding in all quarters will suffer. Humanity has advanced rapidly in the last 400 years mainly due to science. I fear this is about to stop. 2) MSM credibility, methinks, is already gone. 3) Lots of political early retirements. 4) Green parties associate themselves with many environmental causes, a few of them have merit. Regardless of their merit, anything with the tag ‘environment’ will be seen as a scam. 5) Looming energy shortages. This is a bad one. History shows people will go to war over energy supplies. 6) Those holding gas, coal, oil and nuke stocks are in for a good time. 7) Good jobs for those counting the dollars that have been wasted. Thanks for the information will read through the links. Many eons ago, when the Earth was much younger than to day, a life-form , called plants came into being. This life-form used the precious life giving gas in the atmosphere to produce its very structure. This gas was abundant.. at first….. but as the virulent plant life consumed this precious gas, only those species that could adapt to the lowering levels of the life-gas were able to survive. Many billions of species of plant life died, and became buried, and the many billions of tonnes of the life gas were lost for all time. Eventually, like all consumer cycles, a subsistence balance of the life gas/plant cycle was established. If the life gas dropped much lower, not even the most adapted of the plants could survive, but a small rise in the life -gas allowed plant life to flourish. Then along came man, and in his industry, he found ways of releasing the long-buried life-gas for his own warmth and prosperity… and a new age of plant prosperity beckoned. and the plants were happy !! An interesting comment at WUWT. It would be nice to think a few more affected parties might develop some “intestinal fortitude”. The whole sand castle will eventually collapse into a pile and the sooner the better! * That word being “competitive” of course. From an economic perspective any market horribly distorted by subsidies and taxes on competing industries is not “competitive.” Adam Smith would be turning in his grave a such courageous misuse of the term. The big guns are blazing from across the way…. AUSTRALIA will be embracing “unilateral economic disarmament” if it adopts a carbon tax, says the key US Republican congressman on climate change. In a devastating judgment for the Gillard government’s carbon tax plans, Jim Sensenbrenner told The Australian the US had turned its back on a carbon tax. Mr Sensenbrenner said cap and trade – the US term for an emissions-trading scheme – was “dead in the US”. “Any kind of direct carbon tax is dead in the US,” he said. He said the Republicans, who oppose an ETS, had won every coal seat in congress in last year’s election – seats the Democrats would need to win back if they were to regain a majority in the House of Representatives. Mr Sensenbrenner believes climate change stopped former US vice-president Al Gore from becoming president in 2000. Let’s see Gillard dodge that one !! !